There will be periods of 3 inches (or more) an hour snowfall. The storm will spill over into the leeward valleys in the form of rain. With this storm comes some very cold air which will settle in for the next couple of days along with additional snow showers and additional snow accumulations in the mountains. The difference in snow amounts between the Carson Range and Sierra have been amazing this week. The Sierra on the west side of Tahoe has picked up a whopping 3-4 times the snowfall. The difference in the approaching storm will not be so stark. 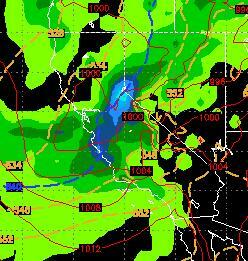 In fact look for a major blizzard late tonight and tomorrow in the Carson range with very heavy snow and high winds. I expect the Carson range to come in at between 2-5 feet and the Sierra with slightly more, around 3-6 feet in the next 3 days. The high Sierra south and west of Tahoe will have places that pick up 7 feet of snow in the next 3 days. Kirkwood appears to poised for an epic dump. Add that to the 3-5 feet and some places will have accumulated 10+ feet of snow this week. Amazing! 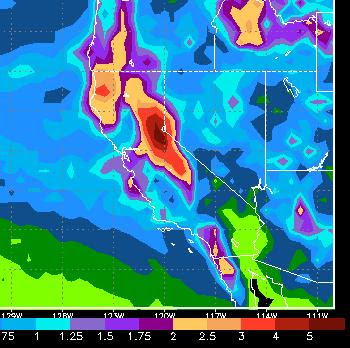 As you can see south and west of Tahoe they are expecting 5+ inches of liquid precip. How much snow that translates to depends on how quickly the cold front drops temperatures. It looks like we will get a couple day break next week (Wed, Thurs) with warm temperatures and dry conditions before the next storm cycle begins. Our "storms" are really just cutoffs from the main storm which usually resides up off the Washington coast. With no high pressure to block these short waves, they come right down the coast, pick up tons of moisture and dump. We have another big storm coming off the coast of Washington starting next Thursday or Friday. That should produce a similar cycle to the one we just went through although I do not believe it will have as much moisture to work with. We can worry about that in a few days but for now ... here it comes, be ready. One last thing, check the Sierra Avalanche Site, the link is on the right of this page. Avalanche danger on the north facing slopes of 35% or more is considerable. All other slopes are at least moderate. This will get much worse as this storm moves in and passes through. If you go out into the back country, be prepared!